Sen. Ted Cruz rolls back his strong stance on RFS and says he would phase it down over next five years. If you think ethanol doesn’t coincide with political success, look to Iowa this week, where one of the Republican frontrunners for presidential nominee, Sen. Ted Cruz (R., Texas), had to do some tweaking of his policy on the renewable fuel standard (RFS) support to deal with ongoing negative press with farmers on his stance on ethanol. At a campaign stop in Cherokee, Iowa, Cruz expressed for the first time that he would keep the RFS through 2022 but would begin to phase it down from 2017 to 2022. 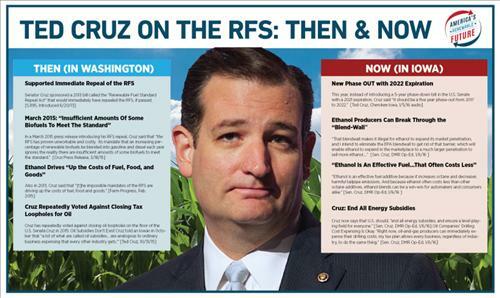 In 2013, Cruz introduced a bill that would have immediately repealed the RFS if it had passed. In 2014 and 2015, he would phase down the volumetric requirements in 2019 and 2020. The America’s Renewable Future has set a goal of educating 45,000 supporters on where the presidential candidates stand on RFS support. ARF released a final report card in January that had Cruz and Sen. Rand Paul (R., Ky.) standing out as the "bad" candidates on the report card, while the rest of the candidates on both sides of the aisle were graded as "good." The report card designates a “good” candidate as one who has demonstrated support for the RFS and Iowa farmers and a “bad” candidate as one who has stood against the RFS and Iowa farmers. The RFS enjoys broad support from Iowa’s Democrat and Republican caucus-goers, with 76% and 61%, respectively, saying in a recent poll that they would be more likely to support a candidate who is pro-RFS. A 2012 survey by Farmers Pulse Opinion Research indicated that 76% of farmers believe the RFS is “very important” or “somewhat important” to “the future profitability of agriculture in the U.S." Interestingly, that higher level of support for the RFS came from a sample in which 71% of the voters contacted indicated that they “strongly disapprove” of President Barack Obama’s job performance. “The RFS is a rare issue that cuts across party lines and deals directly with rural economics,” National Farmers Union (NFU) president Roger Johnson said. NFU commissioned a survey from HaystaqDNA that targeted likely voters in six districts in rural states that flipped from Democrat to Republican in recent elections. Five of the districts surveyed flipped into the Republican column during the 2010 election that gave Republicans control of the Senate, and one flipped in 2014. Johnson noted that support for the RFS outweighed opposition in five out of the six districts surveyed. “Self-identified moderates constituted 39% of the electorate surveyed in the poll, and by a two-to-one margin, these voters said that support for the RFS will make them more likely to vote for a congressional candidate versus voters who say it will make them less likely to support that candidate,” Johnson said. Ryan Fitzpatrick, deputy director of the Clean Energy Program for the Third Way Democrat think tank, added that self-identified moderates have constituted a plurality of the general election electorate in every presidential election since 1976. Voters identifying themselves as moderates have also made up a plurality of the voters supporting the Democrat nominee in every presidential election in the same time period. As a group, these moderate voters tend to lean more Democrat than the overall sample, but nearly a third (32%) report that they tend to split their votes equally between Democrats and Republicans.